Monday 15 January 2018, Nuclear AMRC. The Nuclear AMRC invites you to explore the state of the art in supercritical carbon dioxide coolant and other CO2 applications in advanced machining for the most demanding industries. The Nuclear AMRC is leading research into supercritical CO2 cooling for challenging machining tasks, focusing on deep-hole drilling for nuclear industry applications. 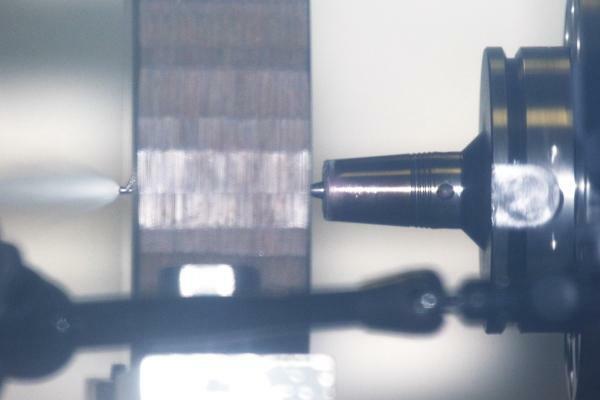 The technology has been shown to increase cutting speeds and reduce tool wear, compared to traditional oil-based coolants and minimum quantity lubricant (MQL) techniques, but needs further R&D to optimise for the most demanding tasks. 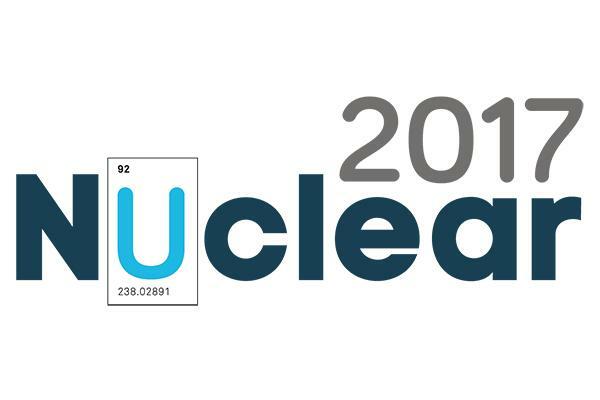 This one-day forum will bring together technology providers – including Fusion Coolant Systems, supplier of the Nuclear AMRC’s system – with industrial users and researchers to discuss the opportunities and challenges of CO2 coolants. We will also look at other applications such as CO2 cleaning. Download the flyer for full details including agenda, or register now. Nuclear industry buyers have a new tool for identifying nuclear-ready suppliers with the launch of F4N Connect. F4N Connect is a fully-searchable online database of UK manufacturers who have demonstrated their ability to meet the expectations of the civil nuclear industry. All listed companies have been granted Fit For Nuclear status after successfully completing the flagship supplier development programme run by the Nuclear AMRC. Helen Arthur, supply chain development programme manager at the Nuclear AMRC, says: “F4N Connect is designed to help nuclear buyers find suppliers they can trust to meet their specific requirements. Whether you need a nuclear-qualified fabricator in the South West, a precision machinist near Sellafield, or a choice of companies who can quote for a complex heat exchanger, F4N Connect will let you find and contact suppliers who can do the job. “With Horizon Nuclear Power moving ahead with new build on Anglesey after securing approval for the ABWR, EDF Energy well underway with Hinkley Point C, and the continuing decommissioning programme around the UK, there are huge opportunities for manufacturers who can demonstrate that they’re ready to win work in nuclear. Delivered exclusively by the Nuclear AMRC – part of the UK’s High Value Manufacturing Catapult – Fit For Nuclear (F4N) lets UK manufacturers measure their operations against the standards required to supply the nuclear industry, and take the necessary steps to close any gaps. More than 130 UK manufacturers have been granted F4N after driving improvements with the support of the Nuclear AMRC’s industrial advisors and nuclear supply chain specialists. Participating companies range from contract manufacturers with no nuclear experience taking a first step into the sector, to established suppliers wanting to benchmark their position and drive business excellence. Most are SMEs operating at tier three or four of the nuclear supply chain, ranging from suppliers of nuclear-grade steels and forgings, to precision machinists, fabricators and specialist service providers. F4N-granted companies can also use their F4N Connect profiles to provide additional information about their products, accreditations and capabilities, including testimonials and case studies. Listings are freely available to all companies which have been granted F4N. The database is independently managed by the Nuclear AMRC as a service to F4N companies – companies cannot pay for placement. More than 65 F4N-granted companies completed their full profile before launch, with others in progress. 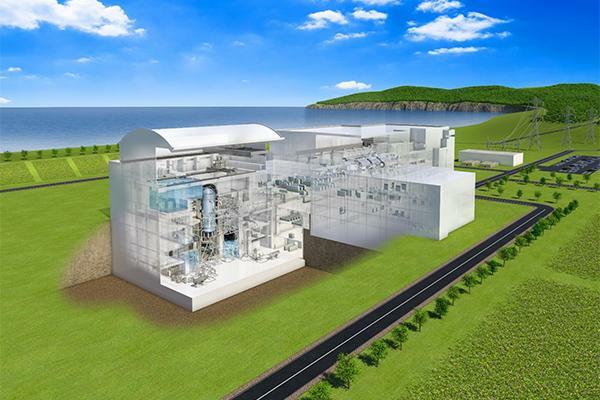 New reactors in North Wales have moved a step closer as the Hitachi-GE Advanced Boiling Water Reactor (ABWR) has been approved for construction in the UK. Horizon Nuclear Power plans to build two 1300MWe ABWRs at the Wylfa Newydd site on Anglesey by the mid-2020s; followed by two at Oldbury, Gloucestershire. The ABWR has now completed the generic design assessment (GDA) managed by the Office for Nuclear Regulation (ONR) and Environment Agency with Natural Resources Wales. This assessment is intended to support the construction of a number of new nuclear power stations by approving a standard reactor design which can be built in different locations by different developers. ONR has now issued a Design Acceptance Confirmation (DAC) and the environment agencies have issued a Statement of Design Acceptability (SoDA) to Hitachi-GE. This means that the regulators are satisfied that the ABWR meets regulatory expectations on safety, security and environmental protection at this stage of the regulatory process. Horizon estimates that around 60 per cent by value of the first reactor will be sourced in the UK, with more local input into later plant. Hitachi-GE has signed agreements with Rolls-Royce and Babcock International to plan and deliver the programme, and will establish an assembly facility for its modular construction technology in the UK. Manufacturers can register their interest via Horizon Nuclear Power supplier registration. The government has launched a new package of support for the next generation of reactor technology, including funding to develop technologies for advanced modular reactors. Details have also been released of the proposed nuclear sector deal, part of the UK’s new industrial strategy. The government is offering funding over the next three years to support research and development into innovative advanced and small modular reactors, and to assess their feasibility and accelerate the development of promising designs. The new government support includes up to £56 million funding for a two-stage advanced modular reactor (AMR) research programme. In the first stage, companies and research institutions can bid for a share of £4 million funding for AMR feasibility projects through the Small Business Research Initiative (SBRI). Up to £40 million follow-on funding may then be made available to projects which can demonstrate clear value for money. The government also released the techno-economic assessment of small modular reactors (SMRs), part of the previous support programme for UK SMR development, which has now closed. Up to £7 million funding to further develop the capability of nuclear regulators to support and assess advanced nuclear technologies. £86 million for the UK Atomic Energy Authority to establish a new Nuclear Fusion Technology Platform. An expert finance group to advise how small reactor projects could raise private investment in the UK. A second phase of the Nuclear Innovation Programme, including up to £8 million for work on modern safety and security methodologies and studies in advanced fuels. A consultation on updating the planning framework for new gigawatt-scale nuclear power stations. Two consultations on the proposed Geological Disposal Facility. Details of the proposed nuclear sector deal were unveiled by the Nuclear Industry Council (NIC), a strategic advisory body comprising industry and government representatives. The Nuclear AMRC is a member of the NIC. A new national supply chain programme, including demand modelling, to be delivered by the Nuclear AMRC. Support for the development of new advanced capabilities through partnerships on modular manufacturing, advanced construction, equipment qualification, and control and instrumentation. Clarity on future trade arrangements and support for exports, including a nuclear trade strategy. Download the NIC nuclear sector deal proposals (pdf). Professor Steve Jones, chief technology officer of the Nuclear AMRC, says: “Simple and Inform are based on the two different philosophies of manufacturing large high-value components – taking the part to the machine, and taking the machine to the part. Both projects aim to provide significant improvements to UK productivity, potentially cutting manufacturing time and cost by half for a variety of large nuclear components. The Inform project (intelligent fixtures for optimised and radical manufacture) will develop an adaptive fixturing system to ease the movement of large parts around a factory, and ensure precision throughout forging, machining, welding, inspection and assembly. The Nuclear AMRC is leading the project, backed by around £1.1 million project funding, with partners include fixturing specialist MetLase, Sheffield Forgemasters, Cambridge Vacuum Engineering, NPL and TWI. The funding will support collaborative R&D over 20 months, and follows an initial three-month feasibility study by the Nuclear AMRC. 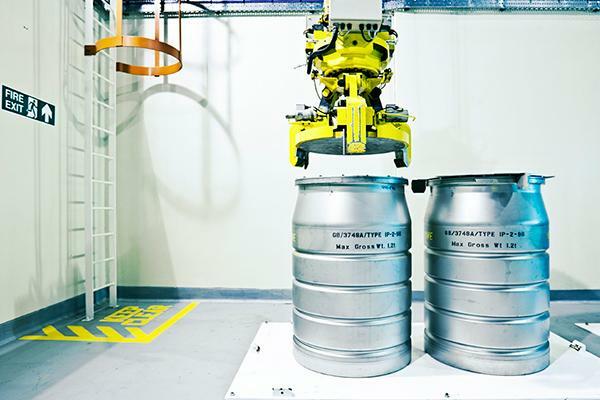 Ultimately, the project aims to cut cost and time for manufacturing large complex nuclear components on a series of dedicated platforms by at least 50 per cent. Moving more efficiently between platforms isn’t the only answer to the challenges of large-scale manufacturing, however. The second project, Simple (single manufacturing platform environment), aims to integrate a range of manufacturing operations onto a single machining platform. Supported by £1.35 million project funding, the Nuclear AMRC will lead a research consortium including two of its sister centres within the High Value Manufacturing Catapult, the Advanced Forming Research Centre and AMRC with Boeing, as well as the University of Sheffield physics department, TWI and Peak NDT. Further development could then integrate this tool with a comprehensive selection of machining, cladding and inspection heads on a single large manufacturing platform. By combining conventional and advanced techniques onto a single platform, the project aims to achieve cost and time savings of at least 50 per cent for a range of complex fabrications. The Simple and Inform projects are funded by the Department for Business, Energy & Industry Strategy (BEIS) through the Small Business Research Initiative (SBRI) managed by Innovate UK. Both projects are supported by a range of nuclear industry partners – including reactor developers and operators, and decommissioning site owners – who will ensure the research is addressing industry challenges. The results will be shared with UK industry, including the Fit For Nuclear network of companies from along the supply chain. Either of the two approaches may prove more beneficial for different components, and elements from both projects could be combined for specific applications to maximise productivity. Download our Q4 newsletter for more on these projects and our other manufacturing R&D. The Nuclear AMRC and Nuclear Industry Association (NIA) are working together to map future contract opportunities in the nuclear market, and help match manufacturers with relevant work packages. The Nuclear AMRC has secured funding from Innovate UK, through the High Value Manufacturing Catapult, to create a robust model of future demand for UK nuclear manufacturing. The model will help manufacturers identify work packages which they can bid for, and allow R&D and support to be focused on areas of the greatest value to the UK supply chain. The demand model will build on work carried out by NIA industrial advisors Glen Little and Chris Savage over the past year to create an initial database of future contract opportunities across the nuclear sector, including new build, decommissioning and naval. “Our work to build a picture of the demand profile for new nuclear plants and detailed work packages was a necessary first step to understanding what future opportunities will look like for the UK’s supply chain,” says Savage. The initial project will focus on particular commodity requirements for a representative new build project. The modelling methodology can then be extended to cover the full range of commodities and components for the new build programme, as well as the requirements of the decommissioning and submarine programmes. The work could also provide valuable information to inform government about where strategic interventions from Whitehall can help address capability gaps in the UK’s nuclear supply chain. The NIA has also joined the Nuclear AMRC as a tier one member. The two organisations will work closely together to share knowledge on the nuclear industry, focusing on demand modelling and other initiatives that will benefit the whole UK supply chain. 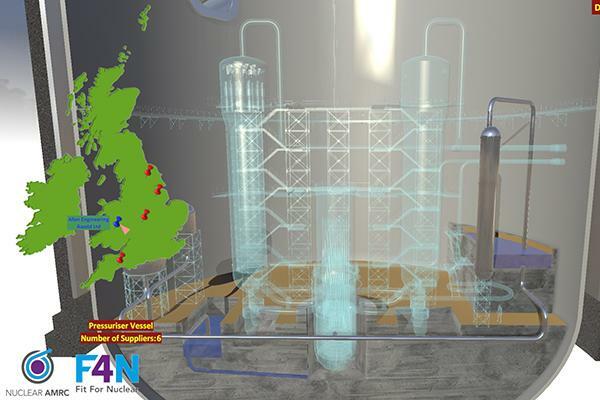 The Nuclear AMRC’s visualisation specialists are combining demand model data with a virtual model of a complete reactor system, to create an interactive and intuitive tool for supply chain development. The prototype system (pictured above) combines a generic reactor design with historic market information about which UK manufacturers have the capabilities to produce each component. 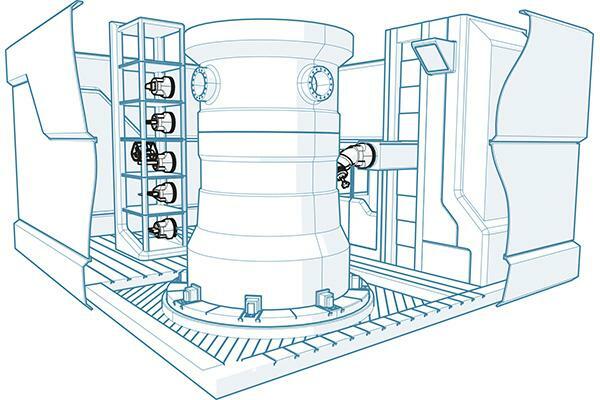 The detailed 3D virtual model allows the reactor to be broken down into its sections, components and commodity types, and identifies suppliers capable of producing each system. Research engineer Craig Hamer says the vision is to integrate the visualisation tool with real reactor designs, live data of supply chain capability and capacity, and the demand model data being developed in collaboration with the NIA. That will give developers, suppliers and other stakeholders an intuitive, interactive tool for understanding specifications, identifying potential supply chain partners, and showcasing domestic involvement in new build projects. The prototype system has been demonstrated at industry events including a High Value Manufacturing Catapult reception at the House of Commons. A new study shows that the UK’s civil nuclear sector contributed £6.4 billion to the national economy last year – equivalent to the aerospace manufacturing industry. The report also finds that the civil nuclear industry’s 65,000 employees are among the most productive workforces in the country. 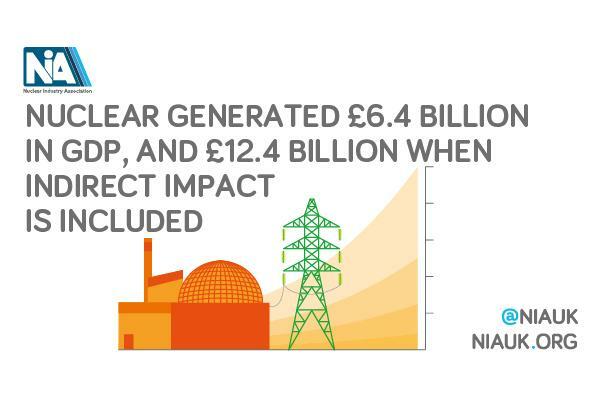 The first Nuclear Activity Report, compiled by Oxford Economics and commissioned by the Nuclear Industry Association (NIA), examines the economic impact of the civil nuclear power industry and its supply chains. It finds that the sector’s economic impact increases to £12.4 billion and 155,000 jobs when the sector’s spend in the supply chain and wages spent by employees are taken into account. This includes around £650 million of indirect impact in the manufacturing and construction sectors. The report highlights the role played by the Nuclear AMRC’s Fit For Nuclear and Civil Nuclear Sharing in Growth programmes in helping UK manufacturers enter and succeed in the nuclear manufacturing supply chain. 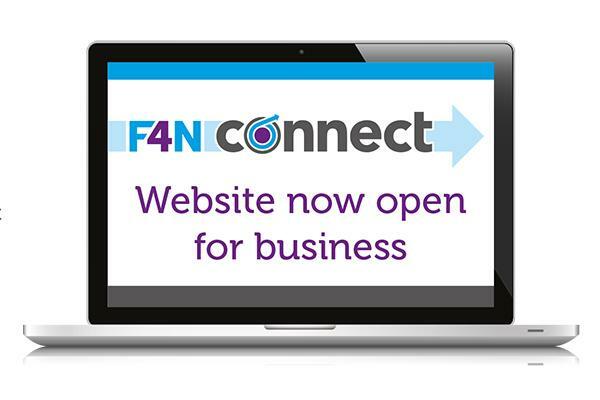 To date, around 630 organisations have taken the initial F4N assessment, with more than 130 being granted F4N. Participating companies showcased in the report include heat exchanger manufacturer Heatric, pump manufacturer Hayward Tyler, and steel specialist Outokumpu Stainless Distribution. The report also highlights the importance of research and innovation within the nuclear sector, including the Nuclear AMRC’s collaboration with member company Cammell Laird to develop modular manufacturing methods for the sector. Innovations from R&D activity diffuse throughout the economy, the report notes, providing benefits far wider than the sector itself and raising productivity across the economy. Andrew Storer, chief executive officer of the Nuclear AMRC, commented: “This study emphasises the important contribution of the UK supply chain capability and capacity. As we replace existing generating plants with new technology, it is vital we ensure innovative R&D is delivered to further improve productivity and give the UK supply chain the technical capabilities to win work globally. The report shows that the benefits of the civil nuclear sector are felt across the country, with the industry’s activities supporting £1 in every £50 of economic output in the north-west and south-west of England. NIA chief executive Tom Greatrex said: “For the first time we have comprehensive data which shows the important role the UK’s civil nuclear sector plays in generating highly skilled and well paid jobs, making a significant contribution to the economy and supplying low carbon electricity to keep the lights on. For more information, download the Nuclear Activity Report. The Game Changers programme presents its latest one-day challenge event to find innovative solutions to the decommissioning challenges at Sellafield. 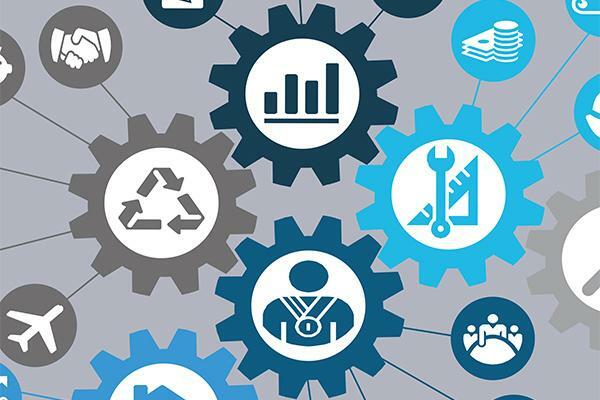 In collaboration with the National Physical Laboratory and Censis, Game Changers invites companies and organisations to bring their innovative techniques, technologies and solutions to the challenges of monitoring and inspecting a range of waste packages. There are thousands of waste containers currently stored on the Sellafield site in west Cumbria, each containing materials and objects which are the result of nuclear reprocessing or decommissioning activities over the past decades. These cans, drums and mostly boxes (collectively known as packages) are placed in above-ground stores across the Sellafield site, and it’s anticipated that there could be more than 150,000 such packages over the next few decades. These packages are currently monitored either by moving them to a designated area for manual inspection; or by installing in-situ devices, which is particularly challenging because of the complexity of waste forms and restrictive storage arrangements. Introducing innovative thinking and technologies into this area of operations should bring significant benefits to Sellafield’s decommissioning programme. The Game Changers programme is looking for innovative technologies and instrumentation which could be considered, including smart packages that monitor themselves, mobile inspection devices, or large area scanning. The Nuclear Industry Association’s annual conference Nuclear 2017 will bring together speakers from across all parts of the nuclear industry to discuss key developments in 2017 and look ahead to 2018. Nuclear 2017 will look at all the issues across new build, operations and decommissioning, and opportunities for next year and beyond. The sector’s senior leaders will discuss Brexit, geological disposal, new nuclear and more, with Nuclear AMRC chief executive Andrew Storer presenting a new model to understand supply chain opportunities. 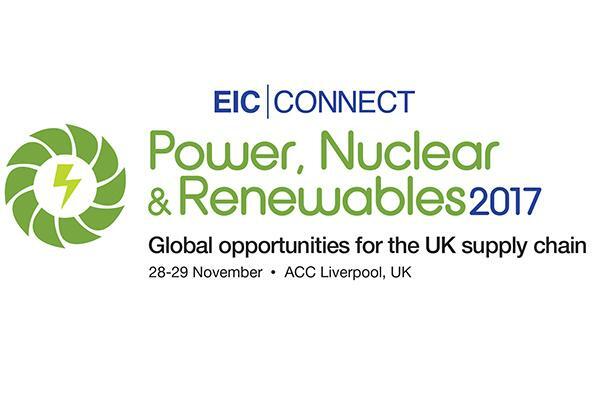 The Energy Industries Council (EIC) presents its flagship event to bring together operators, developers and OEMs from across the world to support UK enterprise and expertise in the global power, nuclear and renewables sectors. The first day focuses on the nuclear sector, with speakers from industry, research and government. Nuclear AMRC chief executive Andrew Storer will appear as part of the opening plenary session alongside Tom Greatrex, chief executive of the Nuclear Industry Association, and Richard McLaren, new build director at Wood. The event also includes opportunities for one-to-one discussions with buyers and decision-makers from the speaker companies, plus a networking dinner. The second day then focuses on the broader power and renewables sectors. The EIC expects at least 500 UK-based businesses to attend, all with the capacity, technology and innovation to build and maintain large scale energy projects. For more information and to register, go to the EIC Connect event website.